I recently did a review of the Cloud b Twilight Buddies Pegasus and mentioned how I was totally in love with the most adorable character in the Cloud b line up. Well, I have to tell you the Twilight Buddies Pegasus has a challenger for the cutest character by Twilight Buddies Unicorn. Okay so I love Twilight Buddies Unicorn. I am not sure whether I like the Unicorn or Pegasus better! My Little One is just as torn between the two as to which one she loves better. I do know that we both love to chill out before bed with each of us having either the Pegasus or Unicorn on our tummies and enjoying the star show on the ceiling. The Twilight Buddies Pegasus and Unicorn have all the same features so which one to get is all dependent on whether you love Unicorns or a Pegasus more. That is one tough call in my books. 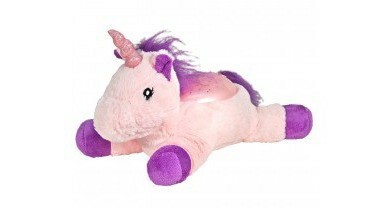 Of course Twilight Buddies Unicorn is so soft and cuddly. She has an awesome, sparkly horn. I love the pink and purple coloring that she has as well. She really wins the heart over which will help for making bedtime settling and relaxing. 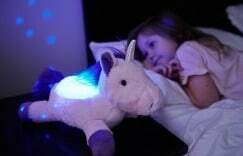 Of course as with all Cloud b products, Twilight Buddies Unicorn has an auto shut off so the batteries are saved and it gets dark when your little one is asleep. Twilight Buddies Unicorn also comes with the batteries in the box which is something I love that Cloud b always does with their products. I love Cloud b products. I recommend that you check their line of products out as they really have something for every child and occasion.